Investors are unwisely ignoring the huge amount of anger directed toward United Airlines. People across the world were shocked this week by footage from a United Continental (NASDAQ:UAL) regional flight. Cellphone videos showed a paying passenger being dragged from his seat and down the aisle after getting bumped from a Chicago-to-Louisville flight to make room for four airline employees who needed to be in Louisville to crew a flight the next morning. This incident sparked a wave of outrage on social media and quickly became front-page news. Yet investors don't seem too concerned. 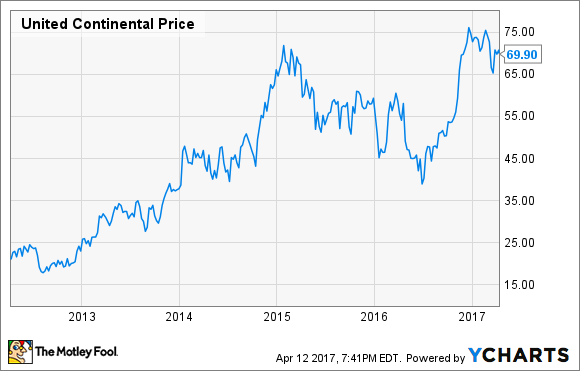 United Continental stock has fallen just slightly this week and remains near its all-time high. United Continental stock performance, data by YCharts. United Continental investors may regret their complacency in the long run. This complete breakdown in protocol -- and common sense -- represents a huge setback in United's multiyear comeback effort. Since taking over as United's CEO in late 2015, Oscar Munoz has focused on rebuilding the carrier's reputation. He had a lot of work to do, as the 2010 United-Continental merger was bungled by the prior management team, leading to huge disruptions for customers. In the past year or so, United Airlines did start to regain customers' trust. However, it still lags the industry average -- and especially top rival Delta Air Lines (NYSE:DAL) -- in most objective metrics of customer service. The Airline Quality Rating report covering 2016 found that relative to Delta, United had a lower on-time percentage, "bumped" more customers, lost more bags, and was the subject of dramatically more official complaints. Furthermore, United had already stirred up social-media criticism last month when it forced two teenage girls who were traveling on "buddy passes" to change out of their leggings before boarding. Many people found the policy to be sexist. The bottom line is that United Continental was treading on shaky ground a week ago. The forcible removal by law enforcement officials of a passenger from one of its flights and the airline's initial unwillingness to take full responsibility simply added to United's customer perception woes. In the past few days, United has been the subject of a huge social-media backlash spanning the globe. United Airlines is facing a sharp backlash after mistreating a customer. Image source: United Airlines. In the U.S., numerous customers canceled their United credit cards and cut up their frequent-flier cards, vowing to never again fly United. Others called for a complete boycott of United Airlines flights. The social-media backlash was even greater in China, perhaps because of a rumor that the passenger who was forcibly removed was singled out for his Asian ethnicity. Some pundits believe that this outrage won't affect United much because consolidation has reduced air travelers' options. However, there are very few routes for which United has a true monopoly. If passengers are willing to pay somewhat more or to take a connecting flight, they'll have other options most of the time. United Airlines isn't so indispensable that it's immune to changing customer preferences. Even leaving aside the customer backlash that United Airlines is likely to face, the company hasn't looked like a compelling investment opportunity lately. Earlier this week, United projected that its unit revenue was approximately flat on a year-over-year basis during Q1. That was slightly better than the 0.5% decline Delta logged. However, United expects to post a first-quarter adjusted pre-tax margin of just 2% to 2.5%, compared with 9.3% for Delta. Meanwhile, United Continental shares trade for slightly more than 10 times forward earnings. That level represents a slight premium relative to Delta Air Lines stock. The sharp rally in United Continental stock since mid-2016 has been driven by optimism that the company is poised to close (or at least narrow) its margin gap relative to Delta. After this week's fiasco, United seems more likely to lose ground in the coming years. Until the dust settles, investors would be wise to steer clear of United Continental shares.